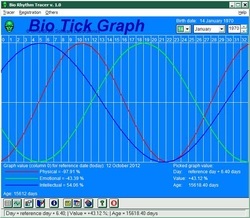 Bio Rhythm Tracer 1.0 is an entertainment software that is designed to draw the biorhythm graph for a person based on the date of birth and a reference date. The program is based on the suppositions of experts from various scientific fields which studies the human being, including medicine, after which, the physical, emotional and intellectual capacity are not constant, but varies periodically after a mathematical template. The mathematical evolving model of physical, emotional or intellectual capacity of any person is a sinusoid with a period of 23, 28 or 33 days. The upper sinusoid depends on the date of birth, actually, the number of days elapsed from that date until now, and the biorhythm curve starts with the three sinus functions from 0 (average) upward.